Plants naturally grow in soil, but modern science has found other ways for them to grow. Once you understand what things soil does for plants, you can then with the help of modern science begin to conceive other ways of doing those things, replacing the need for soil. If you are to manage plant nutrition in hydroponics, tissue culture or any other "artificial" situation, you need the sort of knowledge found in this book. Hydroponics and tissue culture are technologically advanced ways of growing plants without soil. They offer the grower many advantages, not the least an ability to have greater control over how the plant grows. One of the main differences between these two processes is that 'hydroponics' involves the cultivation of the entire plants, whereas 'tissue culture' involves the growth of small pieces of plant tissues. It is of fundamental importance to understand the physiology and nutrient requirement specific to the species that you are cultivating. 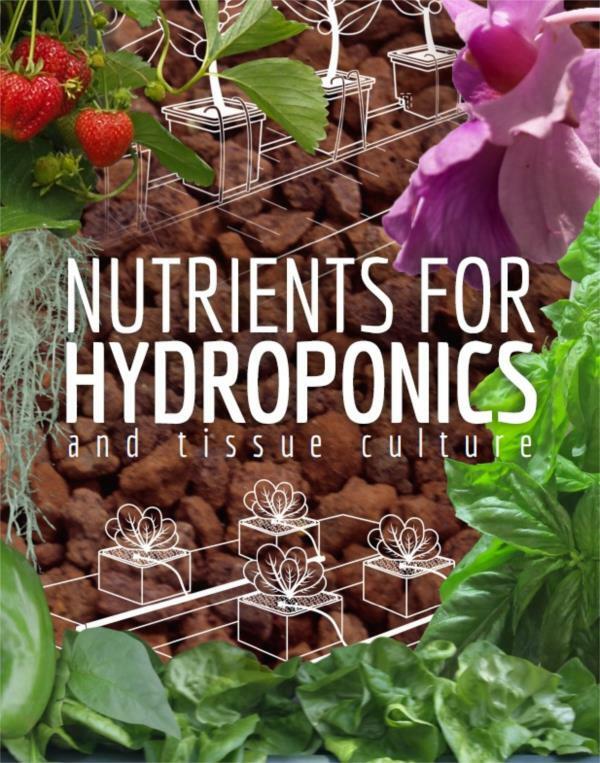 This e-book contains information about nutrient management, disease control, best growth systems used in hydroponics and tissue culture, among others. What Does a Hydroponic Nutrient Look Like? By taking solution samples for analysis on a regular basis, a hydroponic grower can modify a formula to create the most ideal ratios for a particular growing system. 1. Obtain a compete water analysis report of the raw water supply (treat water if necessary to removal ‘unwanted’ minerals such as sodium or high levels of trace elements). 2. Start with a good basic formula for the crop to be grown (many have been published in various sources, however try to select a formula which was designed to be used in a climate similar to what the crop will be produced in i.e. growers in high light/temperature regions would be best advised not to use a formula from a lower light region of the world). 3. Check to see if the formula has adjustments for seedling, vegetative, flowering or fruiting stages (or different seasons). If not, try to determine just what stage of crop the formula is for. 4. Check to see that levels of the nutrients supplied by the formula fall into the approximate ranges given in the earlier table (this can also be done for pre-made concentrate products). 5. Make up the formula carefully (be particularly precise when measuring out the trace elements as some of these are only required in very small amounts). 6. Use the formula to grow the plants. After 2, 4, and 6 week intervals take a solution sample (either directly from the system in the case of NFT or as solution leachate in media based systems) and have a complete analysis carried out. This can then be compared back to the initial mineral levels the formula should have provided. If any of the elements appear to have dropped from the starting levels, then they are being taken up by the plants faster than they are replaced by the stock solutions, so increase this element in the original formulation. Decrease other elements if required. Carry out this analysis process throughout the crop’s lifecycle to determine formulation changes that need to be made at each stage of growth, and apply these to later crops. 7. The process of formulation adjustment can be complex as many of the fertiliser salts don’t just supply one element. Calcium nitrate, for example, supplies both nitrate and calcium and thus if nitrate needs to be increased and calcium decreased, then other salts need to be used to achieve this. To simplify this otherwise quite complex process, nutrient formulation software have been developed which can carry this out automatically giving the required ppm of each element without the calculations involved. 8. Regular solution analysis will also indicate when the solution is becoming so out of balance that a complete replacement (i.e. dump and replace with fresh solution in recirculating systems) is required. It will also show if levels of unwanted elements such as sodium are accumulating and whether dumping is required for this reason. How well a nutrient formulation performs in any given hydroponic system depends on plant nutrient uptake, the suitability and balance of the formulation chosen and the accuracy of weighing up the fertiliser salts and subsequent dilution for use. Most commercial growers carry out the process of regular nutrient solution analysis either on site with their own equipment or by sending solution samples to an agricultural lab. Portable, onsite nutrient analysis systems which measure individual elements are used by many large scale hydroponic producers as they have the advantage of giving instant readings. The Hanna Nutrient Analysis Photometer instrument is one such tool allowing NO3, NH4, P, K, Ca, Mg and S in the nutrient solution to be measured directly by the grower. Smaller growers may not be able to justify the use of solution analysis on a regular basis, however keeping check on growth rates and yields, any signs or symptoms of a nutrient deficiency or toxicity, and even comparing plants grown with different nutrient products or formulations can all help in the process of optimising plant nutrition. If you are serious about understanding hydroponic nutrition; you are unlikely to find anything better to help.